1091 stands outside the shed. This locomotive was built by Henschel & Sohn of Cassel, Germany ( Works No. 15968) in 1918 and was one of approximately 2,500 0-8-0T’s built to the same design by various companies to provide motive power on the systems to the front line on the German side of the battlefields in WW1. No. 1091 is fitted with front and rear axles of the Klein-Lindner type that allows the wheels to move laterally and radially with respect to the axle itself. This allows the locomotive to transverse curves of tighter radius than would be possible with rigid axles. No.1091 was obtained from Naklo Sugar Factory in Poland by a group of members and arrived at Toddington in October 1985. 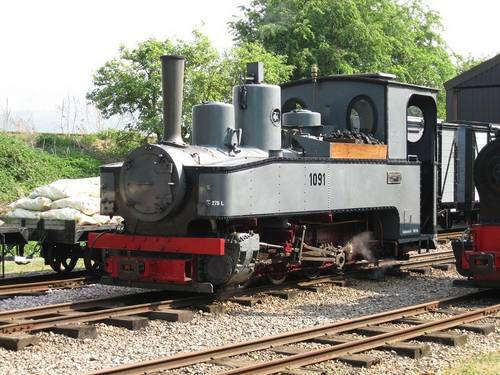 It has now been restored to the original condition as supplied to the German Army and has run on the Leighton Buzzard Light Railway on one occasion double-heading with a 4-6-0T built in the USA for use on the Allied side during WW1..